Atria / 37 INK, 9781501169939, 288pp. From the poet, novelist, and cultural icon behind the award-winning and celebrated Broadway play, for colored girls who have considered suicide/when the rainbow is enuf, comes an evocative and moving bilingual collection of new and beloved poems. 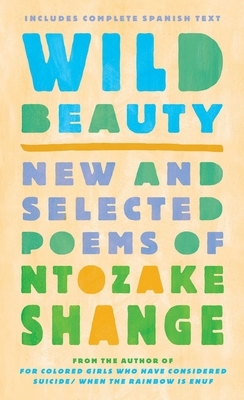 In this stirring collection of more than sixty original and selected poems in both English and Spanish, Ntozake Shange shares her utterly unique, unapologetic, and deeply emotional writing that has made her one of the most iconic literary figures of our time. Ntozake Shange is a renowned playwright, poet, and novelist. Born Paulette Williams in 1948, she received her Bachelor’s degree from Barnard College and her Master’s degree from the University of Southern California. Her works include the Broadway-Produced and Obie Award-winning for colored girls who have considered suicide/when the rainbow is enuf, Betsey Brown, Liliane, and Sassafrass, Cypress & Indigo. She currently lives in Brooklyn, New York. "These powerfully swinging, jabbing, lamenting, testifying, and protesting poems. . . coalesce in a galvanizing, timely, and timeless flow of creativity, valor, compassion, and wisdom."